When it comes to create something with your 3D Printer, the first steps may be a little annoying due to some printing issues that you come up. Extrusion problems is one of the most common ones which can be mostly related to your printing settings. In this post, we will be identifiying the most common extrusion problems and how to solve them. Why does it happen and how can you solve it? The missing layers or gaps in your 3d printed object can show up due to the several causes. First of all, check your filament position. When the spool is poorly wound up or the filament is rolled off incorrectly by the 3D-Printer, the filament can get stuck. This will force the motor and reduce the flow of the filament. That’s why it is important to make sure that the spool is properly loaded. Then, you may check the slicing software filament diameter settings. If it does not match with the diameter of the filament that you work with, you will need to correct software settings. You can find the filament diameter and required temperatures on the box of the material. Or you can easily measure it with the help of callipers. If the diameter setting is ok you can quickly check the nozzle and make sure that it does not have any dirt inside or filament clogged. While cleaning the nozzle, one of the first things you may want to try is manually pushing the filament into the extruder. If filament still does not flow it means that you need to struggle a little bit more! But we make it easier for you: Click here to see our tutorial How to clean your nozzle. If the problem still goes on, you need to check the extrusion multiplier. (or flow rate or flow compensation) Low flow rate setting may cause under extrusion problems as well. You can try to restart the printing process after increasing the flow rate setting in steps of 5%. For example if your extrusion multiplier was 1.0 previously and you change it to 1.05, it means you will be extruding 5% more plastic than you were previously. 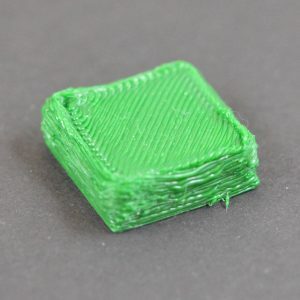 Over-extrusion happens when your printer supplies more material than needed. It can cause excess material on the outside of your printed object. If you have over extrusion issue, first you need to check the extrusion multiplier or flow setting in your software. You can try to decrease the flow setting / extrusion multiplier setting in your printer’s software. The average recommended decrease is between 3-5%. The plastic that exits from the extruder may be between 190 to 240 degrees Celsius. While the plastic is hot, it can easily be formed into different shapes. However, as it cools, it quickly becomes solid. That´s why you need to achieve the correct temperature in order to give the right conditions to your material to flow properly. The wrong temperature would also affect the final quality of your model and the effects may be seen as discoloured filament as the burning material would be darkening some layers. Another sign can be the appearance of uneven layers; when you take a closer look you can see that it’s not so much uneven as melted. It may be look like a wax running down a melted candle. If your hot end is too hot you need to decrease its temperature. You need to find exact temperature to get a fine balance between melting the filament so that it will flow, and enabling the filament to solidify quickly so that the next layer can be applied to a solid surface. Depending on the severity of the overheating, you can drop the temperature in 5ºC intervals. If the filament isn’t being discoloured or doesn´t seem burnt then you can try speeding up the print speed and you can make sure the fans are positioned / working well. By increasing the printing speed, the filament is rushed through the nozzle at a higher speed to keep up with the print head. But be careful, when you pass the recommended printing speed of a filament, your 3D-Printer is probably going to be suffering from under extrusion.